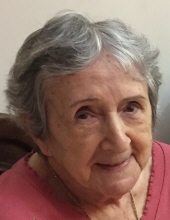 Maria Pilar Oliveto (née Iñigo) passed away peacefully at home, surrounded by loved ones, on 5 February 2019. She was the sweetest, kindest, and gentlest woman to all those who knew her. Born the sixth of 8 children in Buenos Aires, Argentina, Maria Pilar graduated as a teacher. In 1955 she immigrated to the USA, where she married the love of her life, Hector Oliveto, in September 1956. Maria Pilar provided a warm, loving home to Hector and their three children. In 1971, the family moved from Edison, NJ, to Buenos Aires to be close to their extended family. Returning to NJ in 1985, Hector and Maria Pilar settled in Whitehouse Station and lastly in Pennington. Maria Pilar was a wonderful homemaker, an adoring and supportive wife, a devoted and nurturing mother, an excellent listener, and a loyal and empathetic sister, aunt, and friend. She enjoyed needlepoint, traveling, baking Christmas cookies, word games, sending greeting cards, and musical theater. Most of all, she loved spending time with family and friends. She had a strong Catholic faith and rarely went without praying her rosary. Maria Pilar follows her beloved husband of 60 years into the Lord’s comforting embrace. She is survived by her son Carlos and his wife Ryong, daughter Susan and her husband Humberto, daughter Helen, numerous nephews, nieces, grand-nephews, and grand-nieces. Funeral arrangements are managed by Blackwell Memorial Home in Pennington, NJ. To send flowers or a remembrance gift to the family of Maria Pilar Oliveto, please visit our Tribute Store. "Email Address" would like to share the life celebration of Maria Pilar Oliveto. Click on the "link" to go to share a favorite memory or leave a condolence message for the family.